It's finally here! The very first Mystery Knitting Project. Below is a list of materials you need, the first 20 rows of the pattern, and a picture of what your project will look like at this point. There are no fancy stitches in this pattern, but you will be working with two colors. If you have never worked with more than one color at a time before, don't be intimidated. It's easy, I promise! And don't be fooled by the simplicity of the pattern - there is a surprise in store when you are done! 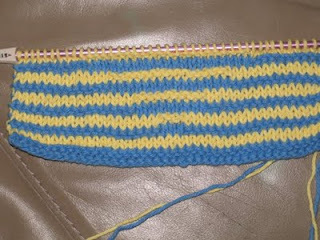 Using color A, cast on 41 stitches using whichever cast on method you prefer. And this is what it should look like at this point. That's it for this episode. I hope you enjoyed listening! Be sure to join me at the end of the month for the next episode. I'll have more magazine and book reviews, the Girls Night In knitting and a movie, and lots more. Until then, Happy Knitting!